A tree set up for people in Kent to remember loved ones lost at Christmas was destroyed by vandals on the first day it was put up in Tunbridge Wells. The tree of light goes up each year in the town centre, to raise money for the Hospice in the Weald at Pembury, Kent. Police were contacted after the tree went up on Thursday and was destroyed on the same night. Robin Apps, from Tunbridge Wells Rotary Club which organises the appeal, said he felt sickened by what had happened. 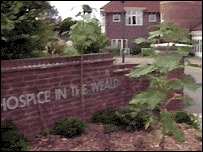 "This is the third year we have put it up," he told BBC Radio Kent. "Every year we have passed on all the proceeds to the hospice. "It makes me feel sick, frankly. "I just wonder what people want out of life and what respect they have got for others."